The present study aims at improving the characterization of myocardial velocities in the context of heart failure with preserved ejection fraction (HFPEF) by combining multiple descriptors. It builds upon a recent extension of manifold learning known as multiple kernel learning (MKL), which allows the combination of data of different natures towards the learning. Such learning is kept unsupervised, thus benefiting from all the inherent explanatory power of the data without being conditioned by a given class. 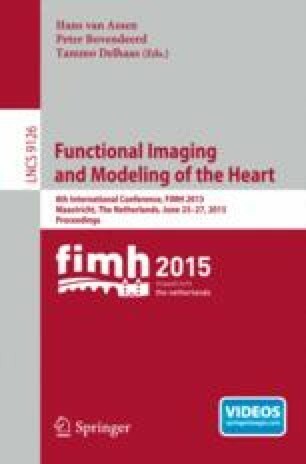 The methodology was applied to 2D sequences from a stress echocardiography protocol from 33 subjects (21 healthy controls and 12 HFPEF subjects). Our method provides a novel way to tackle the understanding of the HFPEF syndrome, in contrast with the diagnostic issues surrounding it in the current clinical practice. Notably, our results confirm that the characterization of the myocardial functional response to stress in this syndrome is improved by the joint analysis of multiple relevant features. The authors acknowledge European Union 7th Framework Programme (VP2HF FP7-2013-611823) and the Spanish Ministry of Economy and Competitiveness (TIN2012-35874). The work of S. Sanchez-Martinez was supported by a fellowship from “la Caixa” Banking Foundation.